Riviera Nayarit and Puerto Vallarta, two stunningly diverse and picturesque regions on Mexico’s Pacific Coast, has been host to a number of well-known celebrities over the past few months, solidifying their reputation as preferential destinations for the showbiz world. With a choice of exclusively luxurious resorts, stunning postcard-perfect landscapes and an endless list of adrenaline-fuelled activities to-do – it’s no wonder they’re becoming known as the playground for the rich and famous. And with the romantic backdrop of pristine sandy shores contrasted against rugged mountains, it’s only a natural choice for destination weddings and honeymoons too. Newlyweds Kim Kardashian and Kanye West enjoyed their second honeymoon in the exclusive resort of Punta Mita (Riviera Nayarit) in July this year. As no stranger to Instagram, Kim posted several photos of herself sunbathing by the pool at the exclusive ‘Casa Aramara’ of her close friend Joe Francis. Her love for this slice of paradise has now extended to her virtual reality, as her Kardashian-themed gaming app now includes a ‘Party in Punta Mita’ themed version. Singer/actress Jessica Simpson followed suit in July, choosing Riviera Nayarit as the destination for her honeymoon with husband Eric Johnson. The pair stayed at the Four Seasons Punta Mita, spending their time drinking cocktails and taking in the breathtaking views hand in hand. 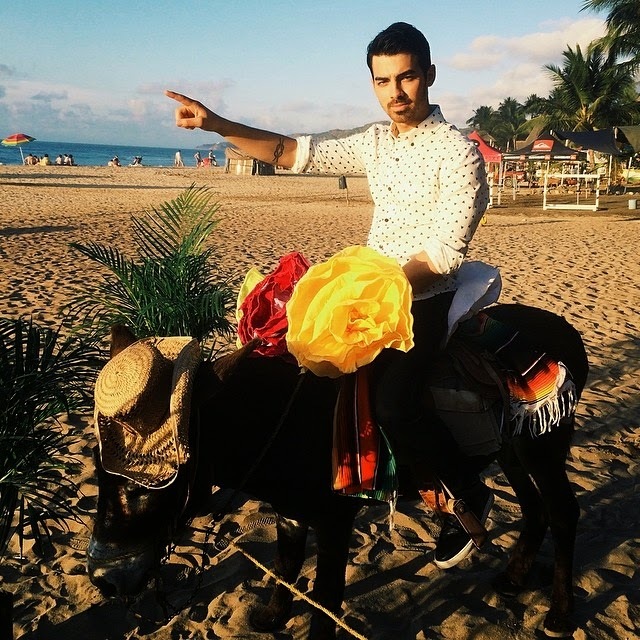 In April Joe Jonas was spotted in Punta Mita and Sayulita, Riviera Nayarit, attending the wedding of his friends and fellow celebrities Nick Lachey and Vanessa Minnillo. The singer took to Instagram to showcase his holiday photos, including cruising along the beach accompanied by a small donkey (or ‘burro’). The Brazilian supermodel, previously the face of Giorgio Armani and Ralph Lauren, visited the Four Seasons Resort Punta Mita and enjoyed a relaxing family getaway with her two children on the ‘Glamour Peninsula’. American teen Disney star Bella Thorne was also seen on holiday in the region this summer, enjoying her time in the Hard Rock Hotel and relaxing on the beaches of Nuevo Vallarta in the Riviera Nayarit. Hollywood is no stranger to Puerto Vallarta. In fact, it was the famous romance on the set of the 1960s classic, “Night of the Iguana” that transformed the sleepy Pacific fishing village. The tinsel town press followed Richard Burton and Elizabeth Taylor to Puerto Vallarta and an international destination was born. Puerto Vallarta welcomed Desperate Housewives actress Eva Longoria in April, as she celebrated her 39th birthday in style at the Garza Blanca Resort’s grand penthouse suite. With a large group of friends she spent her time reclining on the beach and toasting her celebrations by the pool. Best known for his role in the HBO hit “True Blood”, Manganiello has become a regular in Puerto Vallarta, taking great pleasure in hiking and exploring the local fauna in the jungle, kayaking to the famous Los Arcos natural formation, practicing paddle board, snorkeling, and taking Mexican cooking lessons from local chefs. Manganiello´s most recent visit included an exclusive photo shoot for People Magazine after being named Sexiest Bachelor 2014 by the US-celebrity news publication. Before heading to New York for her return to broadway with The “Trip to Bountiful”, actress, singer and model, Vanessa Williams experienced her own trip to abundance at Garza Blanca Preserve Resort & Spa, where the loving couple took were delighted amongst the exotic Sierra Madre setting. “Rush Hour” star Chris Tucker enjoyed a family holiday in the area, staying at Puerto Vallarta’s Casa Velas Resort. While there, Chris and his family partook in a range of water sports and on land adventure activities, making the most of the luscious, tropical surroundings. The two regions are favoured for their exotic climate, adherence to tradition and luxurious amenities, such as world-class spas and golf courses. This makes it unsurprising that so many celebrities appear unable to resist the allure of this true heart of Mexico.